Anneri van der Walt (33) was diagnosed with breast cancer in 2016. After receiving multiple surgeries, chemotherapy and hormonal therapy, the cancer returned and spread. She has two boys aged 1 and 3 years. According to molecular tests, Anneri’s only chance is an Immunotherapy method which is not yet funded by the Medical Aid. It is very expensive (R 4.5 million). We cannot imagine a situation where we are not able to get her access to this potentially life-saving treatment. 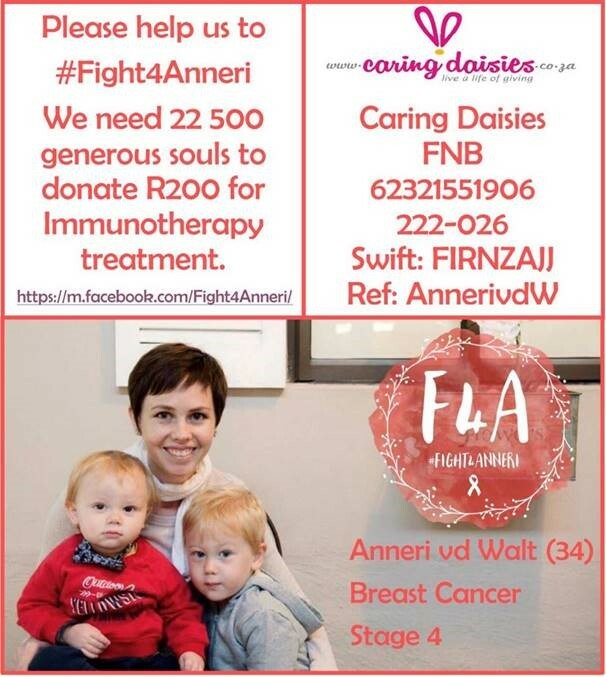 Caring Daisies will be the custodian of Anneri’s donations which can only be used for the treatment of her condition. Any excess funds after Anneri is healthy again will only be donated to a similar cause. As Caring Daisies is a registered NPO a 18A receipt can be issued on request.